Crack Dealers in GTA San Andreas. Crack Dealers are a type of criminal pedestrian appearing in Grand Theft Auto: San Andreas. The first time the player comes into contact with them during the storyline are in the mission Cleaning the Hood, where Carl Johnson and Ryder perform a hit on a Crack Den. They come in four different models, though only two commonly spawn. 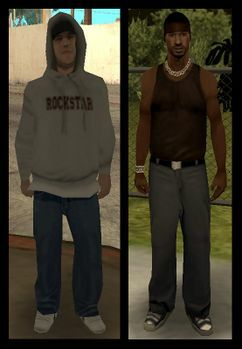 The first has dark skin, a brown muscle shirt, gray pants, black hi-tops, silver jewelry, and a brown beanie; the second has light skin, blue jeans, a Rockstar hoody, a black baseball cap, and white shoes; the third (who only rarely spawns at the beginning of a new game unless the previous two are encountered first) is a biker and has light skin; a leather black sleveless jacket over a white sleveless shirt, leather black pants, black boots, and a black beanie; and the fourth (and only one who never spawns on the street in a normal game, but appears in a cutscene in the mission Ice Cold Killa) is Hispanic and has a gray sleveless shirt, dark blue jeans, black hi-tops, silver chain featuring a cross (identical to the chain worn by the Los Santos Hispanic criminal), and sunglasses.. Sometimes people will walk up to one and a small transaction will take place, although no drugs can be seen. They act as normal people would: if a gunshot is heard nearby, they will either crouch or run away in fear. But if provoked, they will draw out a pistol and attempt to kill the player. If they are killed, they drop a pistol and somewhere over $2,000, which is a good source of money in the game. At the start of the game they spawn very rarely (which means the player may have to be in Los Santos Vagos or Ballas territory in order to see some), but after completion of the mission Doberman, they will start to appear quite frequently in the Ganton area, which could be a hint to the events of The Green Sabre. Even after completion of the storyline, they are still present throughout Los Santos in large numbers. Despite dealers normally only appearing in Los Santos, there is a way to make the biker dealer spawn in San Fierro. If the player replicates the Territory Glitch this will make him appear. He acts the same as the two that are normally present. This page was last modified on 17 September 2016, at 17:27.